The Bialetti Venus 2-Cup stainless steel espresso maker is a high quality espresso maker designed to produce two beautiful cups at a time. 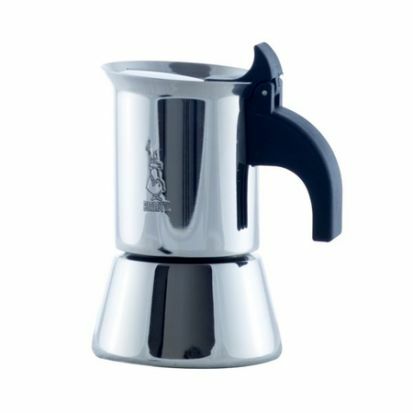 The Bialetti Venus 2-Cup can be used on all hob types except induction - the 4-cup and larger will work on induction hobs, but the base of the 2-cup is too unfortunately too small. It should also be cleaned by hand without detergent, as the taste will improve over time using this method of cleaning so your espressos will get better and better!